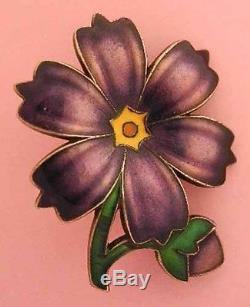 1906 DAVID-ANDERSEN Sterling+Enamel Flower PinEARLY Signed BroochNorwayCOLORS. Exquisite enameling in breath-taking shades of violet purple, deep green, sunny yellow and orange! This lovely enamel on sterling silver brooch or pin is by "the Norwegian Georg Jensen" as Christie Romero called the well respected Norwegian silver makers David-Andersen in. And it bears the old hammer and tongs Andersen signature and dates from around 1906 (the registration date on the back). The piece is highly detailed and the enameling is superb, in brilliant rich hues that, while contrasting sharply, are also quite harmonious together. At the center of the slightly concave flower head is an orange circle framed by a 6-point yellow starburst that echoes the 6 petals of the flowers, giving the brooch a palpable sense of exuberant movement so it fairly bursts with life. Shading along the length of the petals suggests their downy velvet texture, as well as shapely definition. And the bud is placed languidly drooping. The flower head, which adds to the brooch's dimensionality. It measures about 1-1/2 in its longest dimension. It has a roll over safety clasp, which I think is a replacement that was long ago added for increased security. It is signed on the back RD. 1906" (the "D" is smaller and underscored) above "925S " (note the "S is sideways) along with the hammer and tongs that is one of the early signatures of David-Andersen. As you can see in the photos, there are some crazing lines/hairlines in the green enamel. They are completely stable and not likely to worsen and apart from that, the brooch is in Very Good vintage condition with expected surface dirt, light scratches and very slight roughness/surface flakes at the bottom of the stem where enamel meets silver. David-Andersen is known for their artistry in enamel as well as for some of the best Scandinavian mid century modern design. Flowers have inspired artists working in all media through the ages and this is a wonderful interpretation of a glorious bouquet and a terrific and. A prize specimen with glorious colors and lively design, this lovely piece of wearable vintage art will be a superb addition to your collection! Please see our other listings for more great vintage jewelry, including Scandinavian. Both methods include gift box. International buyers aware of the rules and expenses of importing into their country are welcome. WE LOVE TO ANSWER QUESTIONS! If you have a complaint, please let us know. It is our highest ambition to deserve 5 Stars. We thank you for your custom! Powered by SixBit's eCommerce Solution. The item "1906 DAVID-ANDERSEN Sterling+Enamel Flower PinEARLY Signed BroochNorwayCOLORS" is in sale since Thursday, May 07, 2015. This item is in the category "Jewelry & Watches\Vintage & Antique Jewelry\Vintage Ethnic/Regional/Tribal\Scandinavian". The seller is "momandpopcybershop" and is located in Beautiful. This item can be shipped worldwide.